It’s entirely possible that neither the group nor Sonet wanted the music commercially available. Yes, Ornette Coleman’s Free Jazz had already hit the racks, but Albert Ayler’s Spiritual Unity wouldn’t be recorded until halfway through 1964, and John Coltrane’s Ascension was still two years away. Perhaps taking a chance on Prehn’s bold new language didn’t feel economically viable at the time? The Tom Prehn Quartet displayed here is a young one - the four were in their early twenties at the time of recording, and it shows. Tenor saxophonist Frits Krogh sometimes appears to be playing more than he’s listening, and it doesn’t help that this release is sewn together from two of the remaining ‘seldom played’ test pressings. Sonically, Krogh often drowns the others out, and coupled with Finn Slumstrup’s tinny drum kit, one can’t readily decipher Poul Ehlers’ bass or Prehn’s delicate clusters of chords. Thankfully, sax and drums lay out seven minutes into “Axiom 1”, allowing Ehlers and Prehn to bloom. Both tracks ignite in medias res, Krogh frantically summoning shades of later period Dexter Gordon and Sonny Rollins. The second track, “Axiom 2” is a natural continuation of the first. The third piece, “Percussive Anticipations”, was recorded for Swedish radio in 1966 and fares much better in terms of fidelity and structure. The band has clearly matured in three years time, and converse with increased sensitivity. 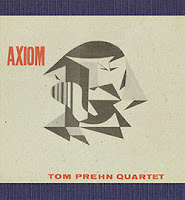 Tom Prehn’s Axiom gives us a rare glimpse into the early days of free jazz in Denmark and is housed in a beautiful cardboard LP-style sleeve. Historical significance aside, it doesn’t really beg repeated listenings, nor offer extraordinary engagement with the listener. This is a group still learning to speak among themselves. All epic poems – from The Iliad to Paradise Lost - begin in media res. It’s one of their defining properties: start in the present and then flashback to make sense of what's happening. It’s also a plot device favoured by Hollywood. I agree only partly, Peter. "Axiom"is an important document of European free jazz regarding the fact that the first Globe Unity performance was only in 1966 at the Berlin Jazz Fest, the Spontaneous Music Ensemble's "Challenge" was released in the same year, as well as Manfred Schoof's "Voices". Brötzmann's "For Adolphe Sax" was released a year later. Therefore "Axiom" stands in a line with Wolfgang Dauner's "Dream Talk" (1964) or Gunter Hampel's "Heartplants" (1965). Especially Slumstrupp's drum style is very adventurous for that time and Krogh is an excellent sax player. I wouldn't say that he drowns the others. Even if the recording cannot quite keep up with the above-mentioned albums it's an astonishing release which was ahead of its time. I'm not certain I understand the purpose of the comment on epic poems. Having never read "all" or every epic poem in existence, I certainly can't verify whether or not they "all" begin in media res. I can say that labels like "all", particularly concerning form, may not sit well with those invested in art forms of any sort, especially on the comment board of a site devoted to art "free" of such confinements. Honestly, it seems to serve as nothing more than a distraction from a nice review by Peter in which he used the term "in media res" to further his points on what really matters in the writing above: the MUSIC. Well done, Peter. There are only a handful of epic poems according to the principles laid down by Aristotle and Horace, and they all begin in media res. As I mentioned, it's a requirement. You appear to have a hair trigger sensitivity and clearly regard anything which is not strictly musical as an irrelevance. My reason for mentioning the point was as a follow on for anyone who might be interested. Clearly, you were not. Describing distraction hardly seems appropriate. Unfortunately, that's the kind of mind I have: making connections. And there's nothing wrong with the word "all" provided you know how to use it. The notion that it connotes labels etc is misconceived. For what it's worth, I made a study of epic poems some years ago. Yes, there are rules, as there are with Greek Drama, but thats how things were done, and they didn't present any serious limitation. You don't have to agree with something to be interested in it. It might have been worth your while doing a tiny bit of online research before committing your views to print. If people would rather I don't comment on albums, even if I'm extending issues, please let me know and I will desist. Also, reading over your comments again, it's possible that you've misunderstood the nature of my very brief comment. It wasn't a criticism of the review, which I agree is excellent. The use of "in media res" was entirely appropriate - it's often used that way. Why that should mean that nothing further can be said is beyond me. Clearly, I forgot the first rules of Internet posting: if it can be misconstrued, it will be. If anyone are interested, we have just re-released "Tom Prehn Kvartet" from '67 on vinyl. We where lucky to get the original mothers from the bassplayer, so this release is as near as you can get to the original, since none of the mastertapes exists. You can buy it at http://rillbar.dk/en/katalog/tom-prehn-kvartet/st, or through https://www.discogs.com/Tom-Prehn-Kvartet-Tom-Prehn-Kvartet/release/8361589. The Axiom record WAS released. I know because a friend of mine has the record, that he purchased in Copenhagen several decades ago. The record has a regular Sonet sleeve and deep-groove red Sonet label, with no indication whatsoever (in the dead wax or elsewhere) that it's a test pressing. It's rare as hen's teeth, but it WAS released. Musically, it's a hard blowing date, much more so than the 1967 record which is much more avant-European in feel (like a Schlippenbach record, perhaps).